» Get to know my smart meter? Why? Get to know my smart meter? Why? The Pacific Power smart meter when it was installed back in March. 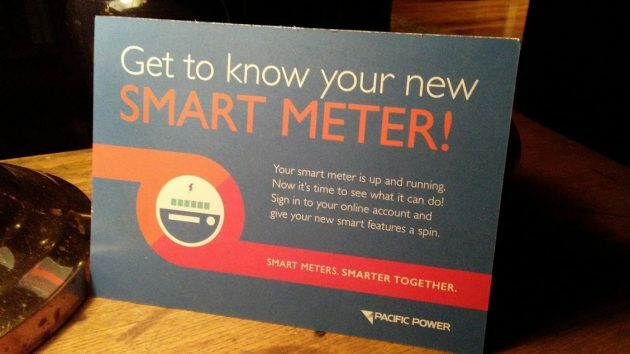 Pacific Power is asking us all to “get to know your new smart meter.” I don’t know about you, but as for me, that’s one complication I didn’t ask for and don’t need. The utility sent a postcard reminding us that the smart meter was installed in the spring. “Now it’s time to see what it can do!” the card says. To do that, you first have to sign in to an online account, and if you don’t have one, you have to create one. I started, but then I stopped. The online form asks for a user name. It has to have so many characters and at least one number. I’ve filled out such forms for several online accounts, and each one asked for a user name. I can remember two or three of my user names, but the others I forgot as soon as I made them up. I don’t see the point of creating yet another one that I then can’t remember. To make matters worse, the Pacific Power site then asks for a password. And it’s supposed to be a password you’ve never used before. Forget that. Same problem as with the user name. I would have to write that password down along with the user name, probably on the “desktop” under the heading “Pacific Power user name and password.” Kind of defeats the purpose, doesn’t it? I haven’t paid attention to our electric meters for as long as I’ve lived. Correction: When I was a teenager and we lived in a fifth-floor walkup, the meter was outside the front door, and to make sure I had turned everything off when I went out, I used to glance at the meter to see that the little wheel had stopped. The postcard from Pacific Power arrived on Monday. I was watching the read-out of data just a day or two before the postcard arrived, and it seemed to me that the info was delivered in some sort of code. Fooey on that sign up. Wait for the monthly bill. Printed in plain American English are current usages & comparisons to prior year. Hasso – you have hit the nail on the head on everything from stupid, insignificant online account requirements to wondering why we need to understand our utility meters! Thank you for voicing my thoughts exactly! My personal favorite incident was having to set up a secure account with a yarn company so I could access a free knitting pattern. We have had our smart meter for 2-3 months now. No increase in the bill. The account and new meter readings allow you to see usage by day, week, month, etc. You can see when your usage increases (such as running the oven at 5pm) on a daily basis, etc. Information is good, not bad. If you had a bill that was large you can go to your usage monitoring and maybe see why. In this day and age; every company and website you interact with anymore has user names and passwords…it’s the 21st Century….I have a list of passwords 2 pages long…it is what it is. I read the header on the postcard and immediately tossed it. I have enough challenges and pastimes, tech-related and otherwise, already without devoting any time to a relationship with my electricity meter. Thanks, Hasso, for addressing the subject of the postcard we received on getting to know “yet another” damned aspect of our over-computerized world. I’m recycling the postcard right now…after blacking out my address. The problem with “getting to know” one’s Smart Meter is that the “knowing” logically leads to the axiomatic likelihood of one developing a serious relationship with one’s Smart Meter. The clearest path forward reads as follows: those enamored with their Smart Meter will demand marital status equality with those who fought for gay marriage. In a blink-of-the-eye, our already miasmic Court system will be further bogged down by the inevitable Human/Smart Meter divorce cases certain to bloom once the efflorescence invariably comes off the Smart Meter rose. Ignore Pacific Power’s Smart Meter invitation; a siren song sucking the very essence out of humanity. One of the dumbest posts I have ever seen anywhere. If you were trying to be funny you failed. Your having exposed my charade has only made me stronger. Why don’t you pick on somebody elses blog to post your stupid comments J. Jacobson. It strikes me that you may have missed the point. You can’t please everyone. Problems abound. Just keep the power on PeePee. aka pacific power your meter education issues will be ……. Miasma however! We sure do have the plague stench of corruption, grifting & colluding with a foreign guvmint over OUR land. A password manager app would take care of your password issues. I’m surprised you’re not paying online already. It’s a lot easier and cheaper to click on a few things than to mail it in. You’re still writing checks in 2018? I just went in and looked at my meter usage. I don’t see the benefit at all. It’s showing me that I use more power in the day time than at night time. More power when it’s really hot outside. I already knew these things. You’re not missing anything by not knowing your power meter stats. This is probably the last time I’ll ever look at them. So, you’re comfortable placing private information in an app? Better to “air gap” the process. There’s the old school method of pen and paper. Then there’s a more techie method advocated by a coworker (former spook and child of spooks) who kept a secure stick on a gold neckchain. My meter is named Aclara. When I met her for the first time outside my house, I saw that she is a very complex individual. She is smart but keeps things to herself. On top of all the passwords and usernames to navigate, they say we should change our passwords every ninety days! Smart meters are just a way for electric co to make more money. Ours read that we used 7,000 kw in one month!! Try to dispute that ! No they say its right evn though in a ten year history we NEVER used that muh . Lesson learned i keep an eye on ours!!! Just remember, every website or anything you sign up for, somebody somewhere knows a little more information about you. Some people are okay with that, some people aren’t. I try to be as selective as I can, weighing if it’s really that important. The power company? Get real. I’ll pass. When I checked it out it looked like an attempt by Pacific Power to get you, the customer, to go to electronic billing. No useful information was found. Thanks for your comment. It’s been my suspicion that the online account thing is about electronic billing. One of our insurance companies now charges five dollars a month to have a paper bill sent out. Some may call me a Luddite, but I prefer paper billing.